DownToDash, an app aimed at making the college experience more truly social, has a rousing story for all entrepreneurs who are willing to get down to work. We’ve all heard, if not had them spoken directly to us, similar words of inspiration. And they never get old. We can never hear them enough. And maybe, just maybe, if we hear these words coming from the right person, under the right circumstances, we’ll accept them not as abstract mantra but living truth. And we’ll find the resolve to bust our tails long enough to one day arrive at a level of achievement where we’ll feel compelled to deliver our own words of encouragement. This startup alone has been through three relaunches, and is alive and gaining traction thanks to Jashnani’s unrelenting efforts – attending networking events, developing partnerships, creating a marketing internship program, to name just a few of the ways she has poured out her energy. Her dream exists thanks to her daring, moving from India to New York because her market research pinpointed the US university ecosystem as the most likely candidate for obtaining early adaptors. Add to her profile the reality of being a young woman in a male-centric startup world, persisting long enough for DownToDash to become one of 12 companies selected to participate in the ELEVACAO NYC Pitch Program (geared toward supporting and empowering women entrepreneurs), and Jashnani’s story serves as a powerful reminder that the American dream endures – cynics, current national politics and economics be damned. From a Founder’s perspective, another key takeaway from the truly remarkable journey of DownToDash making its way into the App Store and Google Play is that having a free product that is absolutely beneficial to your users isn’t nearly enough to attain success. Despite providing university students with “an easy and secure way to meet people and make friends,” it’s taken Jashnani and team numerous campaigns (and what must have felt like an eternity) to find their stride and finally be able to boast of a month in which they’ve added 800 new active users. 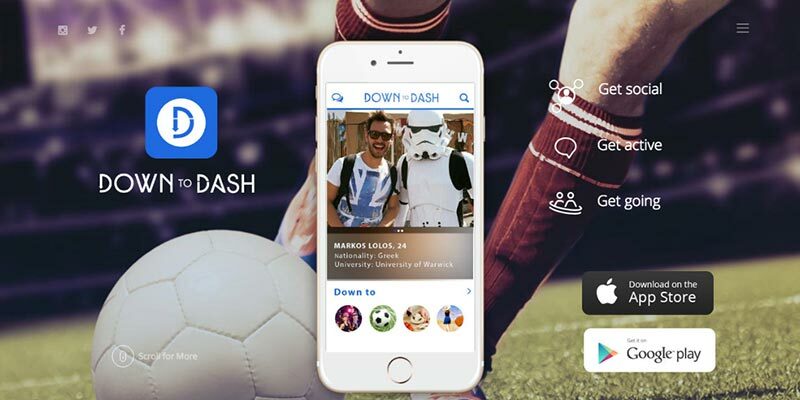 For now, DownToDash is exclusively a student network, requiring a university email address to join the platform. Learn more about the app here. A focus on connecting the campus experience has, no doubt, been essential. But the company has already hinted at expanding to other communities – high schools, business groups, startups – and anyone who underestimates what is possible when you possess the determination to back up your passion is, well, either asleep or afraid of putting in the work.